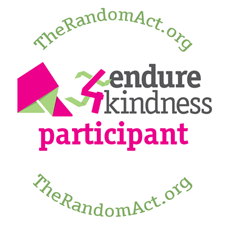 I’ll be participating in Random Act’s “Endure 4 Kindness” (E4K) event on October 18, 2014! This is a global endurance event. Each participant chooses an activity they would like to perform, and then they do it, for as long as they can. The goal? To raise money for Random Acts (www.TheRandomAct.org). This nonprofit organization supports and funds random acts of kindness at home, and around the world. Random Acts is an organization close to my heart. It not only funds and supports random acts of kindness, such as building the The Jacmel Children’s Center (an orphanage and school) in Haiti, but it also encourages every day people like me to #GetKind each day, to the people in our own lives. In addition, it funds grassroots acts of kindness at home, and around the world. See their Kindness Files page for more information. Please help me raise donations for the Endure 4 Kindness project at Crowdrise. Donations of $5 or $10 are very much appreciated! It will add up quickly, as my publisher, Diamond Press, will match each dollar (up to $250) donated to my fundraiser for Endure 4 Kindness at Crowdrise. Please contribute today. Let’s conquer the world, one random act of kindness at a time. UPDATE: My goal was 100 flights of stairs, but I ended up running 201 flights (in a little under 1 hour)! Honestly, this was a miracle to me, as the most I’d ever run at one time before was 75, and one month ago I was only running 40. This challenge was a ton of fun, and I enjoyed every single minute of it! Thank you for supporting Random Acts, and the Endure 4 Kindness fundraiser!